When used in pregnancy during the second and third trimesters, drugs that act directly on the renin-angiotensin system can cause injury and even death to the developing fetus. When pregnancy is detected, AVAPRO should be discontinued as soon as possible. See WARNINGS : Fetal/Neonatal Morbidity and Mortality . AVAPRO ® * (irbesartan) is an angiotensin II receptor (AT 1 subtype) antagonist. Irbesartan is a non-peptide compound, chemically described as a 2-butyl-3-[ p -( o -1 H -tetrazol-5-ylphenyl)benzyl]-1,3-diazaspiro[4.4]non-1-en-4-one. AVAPRO is available for oral administration in unscored tablets containing 75 mg, 150 mg, or 300 mg of irbesartan. Inactive ingredients include: lactose, microcrystalline cellulose, pregelatinized starch, croscarmellose sodium, poloxamer 188, silicon dioxide and magnesium stearate. Irbesartan is a specific competitive antagonist of AT 1 receptors with a much greater affinity (more than 8500-fold) for the AT 1 receptor than for the AT 2 receptor and no agonist activity. Irbesartan is an orally active agent that does not require biotransformation into an active form. The oral absorption of irbesartan is rapid and complete with an average absolute bioavailability of 60-80%. Following oral administration of AVAPRO, peak plasma concentrations of irbesartan are attained at 1.5-2 hours after dosing. Food does not affect the bioavailability of AVAPRO. Studies in animals indicate that radiolabeled irbesartan weakly crosses the blood brain barrier and placenta. Irbesartan is excreted in the milk of lactating rats. 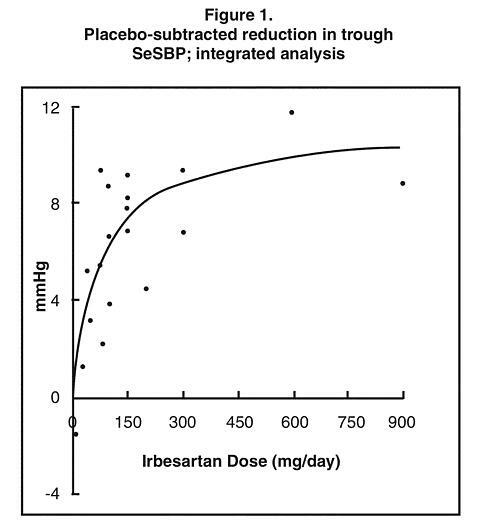 Pediatric: The pharmacokinetics of irbesartan were studied in hypertensive children (age 6-12, n=9) and adolescents (age 13-16, n=12) following single and multiple daily doses of 2 mg/kg (maximum dose of 150 mg per day) for 4 weeks. Accumulation with repeated doses was limited (18%) in both age groups. Clearance rates, AUC values, and C max values were comparable to adults receiving 150 mg daily. Irbesartan pharmacokinetics have not been investigated in patients <6 years of age. Gender: No gender-related differences in pharmacokinetics were observed in healthy elderly (age 65-80 years) or in healthy young (age 18-40 years) subjects. In studies of hypertensive patients, there was no gender difference in half-life or accumulation, but somewhat higher plasma concentrations of irbesartan were observed in females (11-44%). No gender-related dosage adjustment is necessary. Geriatric: In elderly subjects (age 65-80 years), irbesartan elimination half-life was not significantly altered, but AUC and C max values were about 20-50% greater than those of young subjects (age 18-40 years). No dosage adjustment is necessary in the elderly. Race: In healthy black subjects, irbesartan AUC values were approximately 25% greater than whites; there were no differences in C max values. Hepatic Insufficiency: The pharmacokinetics of irbesartan following repeated oral administration were not significantly affected in patients with mild to moderate cirrhosis of the liver. No dosage adjustment is necessary in patients with hepatic insufficiency. In hypertensive patients, chronic oral doses of irbesartan (up to 300 mg) had no effect on glomerular filtration rate, renal plasma flow or filtration fraction. In multiple dose studies in hypertensive patients, there were no clinically important effects on fasting triglycerides, total cholesterol, HDL-cholesterol, or fasting glucose concentrations. There was no effect on serum uric acid during chronic oral administration, and no uricosuric effect. The antihypertensive effects of AVAPRO (irbesartan) were examined in seven (7) major placebo-controlled 8-12 week trials in patients with baseline diastolic blood pressures of 95-110 mmHg. Doses of 1-900 mg were included in these trials in order to fully explore the dose-range of irbesartan. These studies allowed comparison of once- or twice-daily regimens at 150 mg/day, comparisons of peak and trough effects, and comparisons of response by gender, age, and race. Two of the seven placebo-controlled trials identified above examined the antihypertensive effects of irbesartan and hydrochlorothiazide in combination. The seven (7) studies of irbesartan monotherapy included a total of 1915 patients randomized to irbesartan (1-900 mg) and 611 patients randomized to placebo. Once-daily doses of 150 and 300 mg provided statistically and clinically significant decreases in systolic and diastolic blood pressure with trough (24 hours post-dose) effects after 6-12 weeks of treatment compared to placebo, of about 8-10/5-6 and 8-12/5-8 mmHg, respectively. No further increase in effect was seen at dosages greater than 300 mg. The dose-response relationships for effects on systolic and diastolic pressure are shown in Figures 1 and 2. Once-daily administration of therapeutic doses of irbesartan gave peak effects at around 3-6 hours and, in one ambulatory blood pressure monitoring study, again around 14 hours. This was seen with both once-daily and twice-daily dosing. Trough-to-peak ratios for systolic and diastolic response were generally between 60-70%. In a continuous ambulatory blood pressure monitoring study, once-daily dosing with 150 mg gave trough and mean 24-hour responses similar to those observed in patients receiving twice-daily dosing at the same total daily dose. 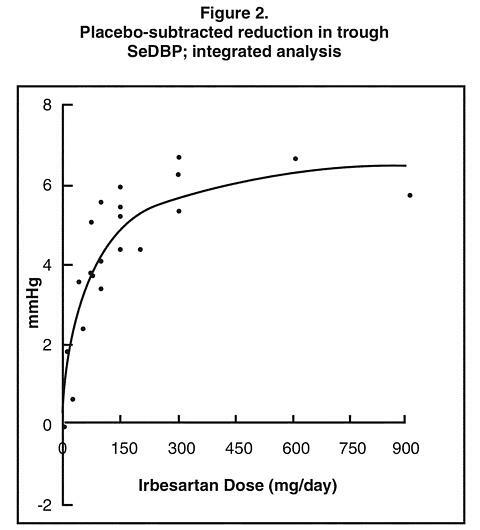 In controlled trials, the addition of irbesartan to hydrochlorothiazide doses of 6.25, 12.5, or 25 mg produced further dose-related reductions in blood pressure similar to those achieved with the same monotherapy dose of irbesartan. HCTZ also had an approximately additive effect. The Irbesartan Diabetic Nephropathy Trial (IDNT) was a randomized, placebo- and active-controlled, double-blind multicenter study, conducted worldwide in 1715 patients with type 2 diabetes, hypertension (SeSBP >135 mmHg or SeDBP >85 mmHg), and nephropathy (serum creatinine 1.0 to 3.0 mg/dL in females or 1.2 to 3.0 mg/dL in males and proteinuria >/=900 mg/day). Patients were randomized to receive AVAPRO (irbesartan) 75 mg, amlodipine 2.5 mg, or matching placebo once daily. Patients were titrated to a maintenance dose of AVAPRO 300 mg, or amlodipine 10 mg, as tolerated. Additional antihypertensive agents (excluding ACE inhibitors, angiotensin II receptor antagonists and calcium channel blockers) were added as needed to achieve blood pressure goal (</=135/85 or 10 mmHg reduction in systolic blood pressure if higher than 160 mmHg) for patients in all groups. The study population was 66.5% male, 72.9% below 65 years of age and 72% White, (Asian/Pacific Islander 5.0%, Black 13.3%, Hispanic 4.8%). The mean baseline seated systolic and diastolic blood pressure were 159 mmHg and 87 mmHg, respectively. The patients entered the trial with a mean serum creatinine of 1.7 mg/dL and mean proteinuria of 4144 mg/day. The primary composite endpoint was the time to occurrence of any one of the following events: doubling of baseline serum creatinine, end-stage renal disease (ESRD; defined by serum creatinine >/=6 mg/dL, dialysis, or renal transplantation) or death. Treatment with AVAPRO resulted in a 20% risk reduction versus placebo (p=0.0234) (see Figure 3 and Table 1). Treatment with AVAPRO also reduced the occurrence of sustained doubling of serum creatinine as a separate endpoint (33%), but had no significant effect on ESRD alone and no effect on overall mortality (See Table 1). The percentages of patients experiencing an event during the course of the study can be seen in Table 1 below. The secondary endpoint of the study was a composite of cardiovascular mortality and morbidity (myocardial infarction, hospitalization for heart failure, stroke with permanent neurological deficit, amputation). There were no statistically significant differences among treatment groups in these endpoints. Compared with placebo, AVAPRO (irbesartan) significantly reduced proteinuria by about 27%, an effect that was evident within 3 months of starting therapy. AVAPRO significantly reduced the rate of loss of renal function (glomerular filtration rate), as measured by the reciprocal of the serum creatinine concentration, by 18.2%. Table 2 presents results for demographic subgroups. Subgroup analyses are difficult to interpret and it is not known whether these observations represent true differences or chance effects. For the primary endpoint, AVAPRO's favorable effects were seen in patients also taking other antihypertensive medications (angiotensin II receptor antagonists, angiotensin-converting-enzyme inhibitors and calcium channel blockers were not allowed), oral hypoglycemic agents, and lipid-lowering agents. AVAPRO is indicated for the treatment of hypertension. It may be used alone or in combination with other antihypertensive agents. AVAPRO is indicated for the treatment of diabetic nephropathy with an elevated serum creatinine and proteinuria (>300 mg/day) in patients with type 2 diabetes and hypertension. 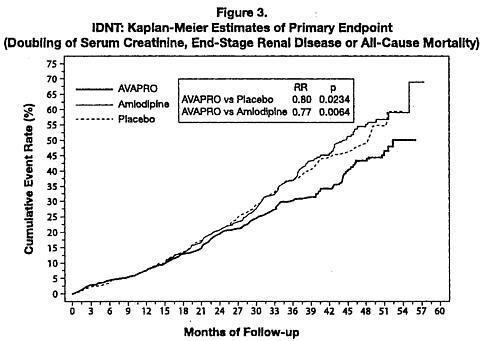 In this population, AVAPRO reduces the rate of progression of nephropathy as measured by the occurrence of doubling of serum creatinine or end-stage renal disease (need for dialysis or renal transplantation) (see CLINICAL PHARMACOLOGY : Clinical Studies ). Drugs that act directly on the renin-angiotensin system can cause fetal and neonatal morbidity and death when administered to pregnant women. Several dozen cases have been reported in the world literature in patients who were taking angiotensin-converting-enzyme inhibitors. When pregnancy is detected, AVAPRO should be discontinued as soon as possible. Mothers whose embryos and fetuses are exposed to an angiotensin Il receptor antagonist only during the first trimester should be so informed. Nonetheless, when patients become pregnant, physicians should have the patient discontinue the use of AVAPRO as soon as possible. If oligohydramnios is observed, AVAPRO (irbesartan) should be discontinued unless it is considered life-saving for the mother. Contraction stress testing (CST), a non-stress test (NST), or biophysical profiling (BPP) may be appropriate depending upon the week of pregnancy. Patients and physicians should be aware, however, that oligohydramnios may not appear until after the fetus has sustained irreversible injury. When pregnant rats were treated with irbesartan from day 0 to day 20 of gestation (oral doses of 50, 180, and 650 mg/kg/day), increased incidences of renal pelvic cavitation, hydroureter and/or absence of renal papilla were observed in fetuses at doses >/=50 mg/kg/day [approximately equivalent to the maximum recommended human dose (MRHD), 300 mg/day, on a body surface area basis]. Subcutaneous edema was observed in fetuses at doses >/=180 mg/kg/day (about 4 times the MRHD on a body surface area basis). As these anomalies were not observed in rats in which irbesartan exposure (oral doses of 50, 150, and 450 mg/kg/day) was limited to gestation days 6-15, they appear to reflect late gestational effects of the drug. In pregnant rabbits, oral doses of 30 mg irbesartan/kg/day were associated with maternal mortality and abortion. Surviving females receiving this dose (about 1.5 times the MRHD on a body surface area basis) had a slight increase in early resorptions and a corresponding decrease in live fetuses. Irbesartan was found to cross the placental barrier in rats and rabbits. Excessive reduction of blood pressure was rarely seen (<0.1%) in patients with uncomplicated hypertension. Initiation of antihypertensive therapy may cause symptomatic hypotension in patients with intravascular volume- or sodium-depletion, e.g., in patients treated vigorously with diuretics or in patients on dialysis. Such volume depletion should be corrected prior to administration of AVAPRO, or a low starting dose should be used (see DOSAGE AND ADMINISTRATION ). As a consequence of inhibiting the renin-angiotensin-aldosterone system, changes in renal function may be anticipated in susceptible individuals. In patients whose renal function may depend on the activity of the renin-angiotensin-aldosterone system (e.g., patients with severe congestive heart failure), treatment with angiotensin-converting-enzyme inhibitors has been associated with oliguria and/or progressive azotemia and (rarely) with acute renal failure and/or death. AVAPRO would be expected to behave similarly. In studies of ACE inhibitors in patients with unilateral or bilateral renal artery stenosis, increases in serum creatinine or BUN have been reported. There has been no known use of AVAPRO in patients with unilateral or bilateral renal artery stenosis, but a similar effect should be anticipated. In vitro studies show significant inhibition of the formation of oxidized irbesartan metabolites with the known cytochrome CYP 2C9 substrates/inhibitors sulphenazole, tolbutamide and nifedipine. However, in clinical studies the consequences of concomitant irbesartan on the pharmacodynamics of warfarin were negligible. Based on in vitro data, no interaction would be expected with drugs whose metabolism is dependent upon cytochrome P450 isozymes 1A1, 1A2, 2A6, 2B6, 2D6, 2E1, or 3A4. No evidence of carcinogenicity was observed when irbesartan was administered at doses of up to 500/1000 mg/kg/day (males/females, respectively) in rats and 1000 mg/kg/day in mice for up to two years. For male and female rats, 500 mg/kg/day provided an average systemic exposure to irbesartan (AUC 0-24h , bound plus unbound) about 3 and 11 times, respectively, the average systemic exposure in humans receiving the maximum recommended dose (MRD) of 300 mg irbesartan/day, whereas 1000 mg/kg/day (administered to females only) provided an average systemic exposure about 21 times that reported for humans at the MRD. For male and female mice, 1000 mg/kg/day provided an exposure to irbesartan about 3 and 5 times, respectively, the human exposure at 300 mg/day. Irbesartan had no adverse effects on fertility or mating of male or female rats at oral doses </=650 mg/kg/day, the highest dose providing a systemic exposure to irbesartan (AUC 0-24h , bound plus unbound) about 5 times that found in humans receiving the maximum recommended dose of 300 mg/day. See WARNINGS : Fetal/Neonatal Morbidity and Mortality . Pharmacokinetic parameters in pediatric subjects (age 6-16, n=21) were comparable to adults. At doses up to 150 mg daily for 4 weeks, AVAPRO (irbesartan) was well tolerated in hypertensive children and adolescents (see CLINICAL PHARMACOLOGY : Special Populations ). Blood pressure reductions were comparable to adults receiving 150 mg daily; however, greater sensitivity in some patients cannot be ruled out (see DOSAGE AND ADMINISTRATION : Pediatric Patients ). AVAPRO has not been studied in pediatric patients less than 6 years old. AVAPRO has been evaluated for safety in more than 4300 patients with hypertension and about 5000 subjects overall. This experience includes 1303 patients treated for over 6 months and 407 patients for 1 year or more. Treatment with AVAPRO was well-tolerated, with an incidence of adverse events similar to placebo. These events generally were mild and transient with no relationship to the dose of AVAPRO. In placebo-controlled clinical trials, discontinuation of therapy due to a clinical adverse event was required in 3.3% of patients treated with AVAPRO, versus 4.5% of patients given placebo. In placebo-controlled clinical trials, the following adverse event experiences reported in at least 1% of patients treated with AVAPRO (n=1965) and at a higher incidence versus placebo (n=641), excluding those too general to be informative and those not reasonably associated with the use of drug because they were associated with the condition being treated or are very common in the treated population, include: diarrhea (3% vs. 2%), dyspepsia/heartburn (2% vs. 1%), and fatigue (4% vs. 3%). Special Senses: vision disturbance, hearing abnormality, ear infection, ear pain, conjunctivitis, other eye disturbance, eyelid abnormality, ear abnormality. In clinical studies in patients with hypertension and type 2 diabetic renal disease, the adverse drug experiences were similar to those seen in patients with hypertension with the exception of an increased incidence of orthostatic symptoms (dizziness, orthostatic dizziness, and orthostatic hypotension) observed in IDNT (proteinuria >/=900 mg/day, and serum creatinine ranging from 1.0-3.0 mg/dL). In this trial, orthostatic symptoms occurred more frequently in the AVAPRO group (dizziness 10.2%, orthostatic dizziness 5.4%, orthostatic hypotension 5.4%) than in the placebo group (dizziness 6.0%, orthostatic dizziness 2.7%, orthostatic hypotension 3.2%). The following have been very rarely reported in post-marketing experience: urticaria; angioedema (involving swelling of the face, lips, pharynx, and/or tongue); increased liver function tests; jaundice. Hyperkalemia has been rarely reported. In controlled clinical trials, clinically important differences in laboratory tests were rarely associated with administration of AVAPRO (irbesartan). Hematologic: Mean decreases in hemoglobin of 0.2 g/dL were observed in 0.2% of patients receiving AVAPRO compared to 0.3% of placebo-treated patients. Neutropenia (<1000 cells/mm 3 ) occurred at similar frequencies among patients receiving AVAPRO (0.3%) and placebo-treated patients (0.5%). Hyperkalemia: In IDNT (proteinuria >/=900 mg/day, and serum creatinine ranging from 1.0-3.0 mg/dL), the percent of patients with hyperkalemia (>6 mEq/L) was 18.6% in the AVAPRO group vs. 6.0% in the placebo group. Discontinuations due to hyperkalemia in the AVAPRO group were 2.1% vs. 0.4% in the placebo group. The recommended initial dose of AVAPRO is 150 mg once daily. Patients requiring further reduction in blood pressure should be titrated to 300 mg once daily. A low dose of a diuretic may be added, if blood pressure is not controlled by AVAPRO alone. 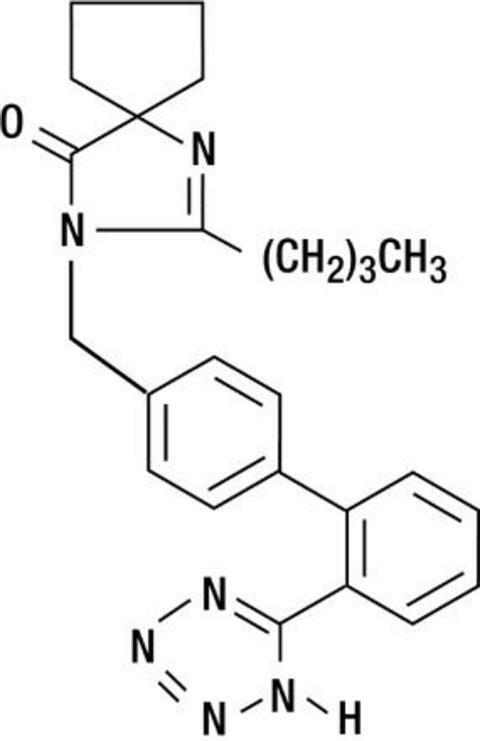 Hydrochlorothiazide has been shown to have an additive effect (see CLINICAL PHARMACOLOGY : Clinical Studies ). Patients not adequately treated by the maximum dose of 300 mg once daily are unlikely to derive additional benefit from a higher dose or twice-daily dosing. The recommended target maintenance dose is 300 mg once daily. There are no data on the clinical effects of lower doses of AVAPRO on diabetic nephropathy (see CLINICAL PHARMACOLOGY : Clinical Studies ). Children (<6 years): Safety and effectiveness have not been established. Children (6-12 years): An initial dose of 75 mg once daily is reasonable. Patients requiring further reduction in blood pressure should be titrated to 150 mg once daily (see PRECAUTIONS : Pediatric Use ). Adolescent patients (13-16 years): An initial dose of 150 mg once daily is reasonable. Patients requiring further reduction in blood pressure should be titrated to 300 mg once daily. Higher doses are not recommended (see PRECAUTIONS : Pediatric Use ). A lower initial dose of AVAPRO (irbesartan) (75 mg) is recommended in patients with depletion of intravascular volume or salt (e.g., patients treated vigorously with diuretics or on hemodialysis) (see WARNINGS : Hypotension in Volume- or Salt-depleted Patients ). Store at 25° C (77° F); excursions permitted to 15° C - 30° C (59° F - 86° F) [see USP Controlled Room Temperature].